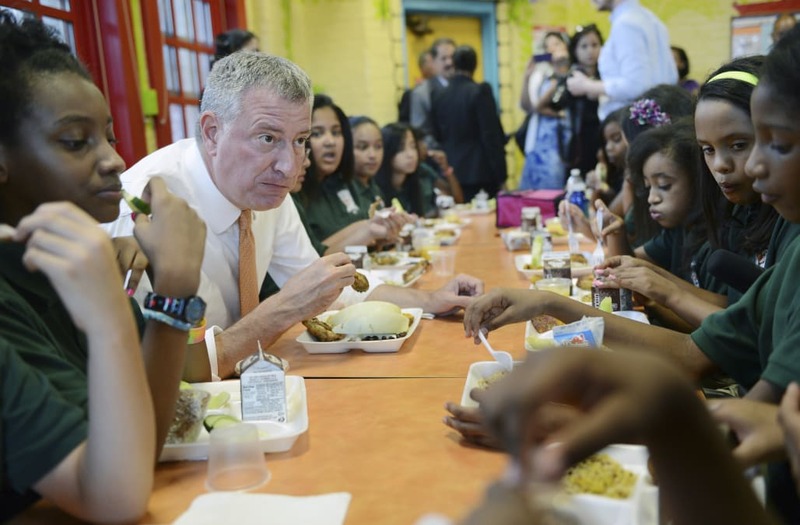 The city's school Chancellor Carmen Fariña recently announced that free lunch would now be available to the city's 1.1 million students, regardless of income level. Previously, free lunch was only available to low income students who qualified.New York City may be littered with gluten-loving rats and paved with chicken bone highways, but if there's one thing the city's occasionally good at, it's policy. The city's move comes after a series of articles sparked a nationwide outrage about "lunch-shaming," the practice of shaming kids — or requiring them to do labor — when they can't afford lunch. Instead of admitting they don't have the money, many students will often just forego lunch. What kind of country denies free frozen pizza to kids? Approximately 75 percent of New York City students qualify for free or reduced-price lunch. The new initiative is expected to reach an additional 200,000 students and save families $300 a year. As someone who spent years working in New York City schools, I can verify that the competition for lunch snacks is indeed brutal. I once witnessed a confrontation between a Security Guard and a student over a turkey sandwich that almost became physical, and was profoundly embarrassing for everyone involved. Since the free lunch program is a federal program, the city's budget will remain largely unaffected. Sorry Paul Ryan! This meal's on you.